IACCM research confirms growing use of performance and outcome-based contracting models – and also confirms that many organisations are struggling with their effective definition, implementation and use, we are therefore pleased to offer training options to improve the capability of member organisations in these important offerings. 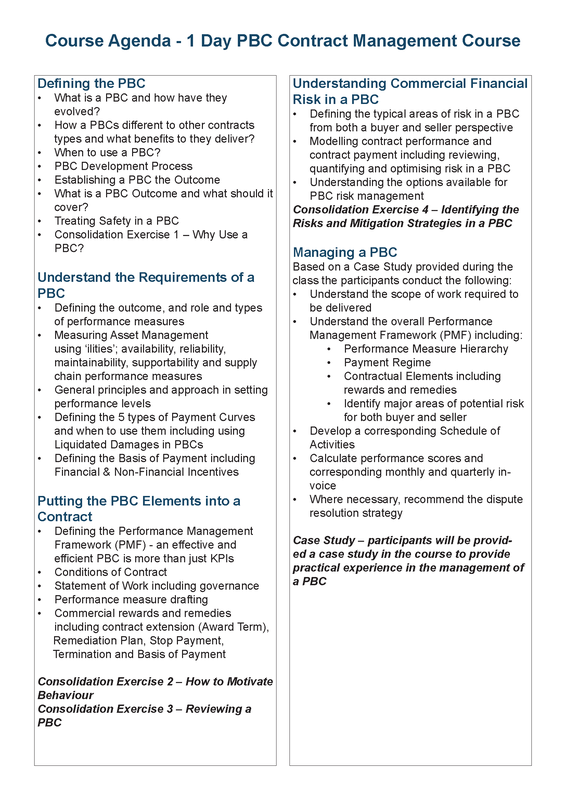 Performance and Outcome-Based Contracting (PBC) has proven to be an effective tool in reducing overall costs for buyers and providing profitable growth opportunities for sellers, making it the contract model of choice across a range of market sectors. But as many have discovered, PBCs require a different approach to their development, implementation and management – in particular in how performance indicators are established, defined and measured. The scale of this challenge is shown by the frequency of disputes and the extent to which poorly structured performance and outcome-based contracts lead to financial and reputational damage. IACCM is delighted to offer training programs delivered by one of the world’s top experts in performance-based contracting models and practices. Dr Andrew Jacopino – recently appointed an IACCM Fellow – has 15 years’ experience in both private and public sector PBCs of all shapes and sizes. Most recently, he led the establishment of the Centre of Excellence at the Australian Department of Defence, which has shown repeated success in generating win-win relationships and agreements especially in large, long-term, complex technical arrangements. The one-day ‘Managing a PBC’ class is designed for directors, program and project managers, engineering and technical staff, logistics staff and contract managers from both buyer and seller organisations responsible for operating in and managing PBCs.